We can design and install a high performance pigmented or decorative floor over an existing floor that requires resurfacing or over a new concrete floor. 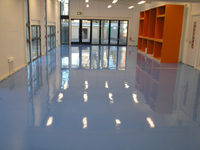 Every epoxy floor is installed according to specification with full customer satisfaction always the goal. 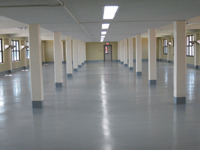 An epoxy coating or paint is a protective material made from epoxy-based resin. It provides outstanding resistance to corrosive chemicals, heat, and ultra-violet light; has convenient drying times; exhibits excellent dimensional stability, extreme toughness, and abrasion resistance; and provides strong adhesion to a wide range of substrates, including glass, metals, fibers and numerous other modern materials. An epoxy coating may be used in a wide range of interior and exterior applications across many industries including building and construction, industrial, electronics, and agriculture. Some specific examples serve to highlight the broad application of epoxy coatings. 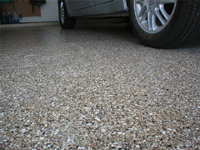 In building and construction, an epoxy coating may be used for high performance and decorative flooring applications, both in heavy foot and vehicle traffic areas and settings which require high aesthetics, such as colored concrete and terrazzo. In the marine industry, an epoxy coating is used as a primer to enhance adhesion of paints applied as a final coating to hulls and decks. An epoxy coating may also be used to protect the internal surface of fiber-reinforced hulls. In the food industry, an epoxy coating may be applied to metal containers to prevent rust and taste degradation. Technically, an epoxy or polyepoxide coating is a thermosetting copolymer. It is a copolymer because it is formed from the combination of two different materials — an epoxide resin and a polyamine hardener. The hardener is effectively a catalyst that promotes polymerization. The polymerization process produces extensive cross-linking of the two materials contributing to the compound's strength. An epoxy coating is thermosetting because mixing the resin and hardener triggers polymerization, or curing, that generates heat. The polymerization process can be controlled by carefully varying the proportion of resin and hardener and the prevailing temperature. Some applications benefit from extended curing and high heat. The curing period can vary from minutes to hours or days. Prior to compounding, both the resin and hardener are liquids with low viscosity at room temperature and so can be easily handled. The quality of a finished product can vary significantly according to the precise proportions of resin and hardener used, however. The compounding may be performed by specialist firms if the ultimate user of the compound is not a large volume, experienced consumer. Epoxy coatings and paints may be divided into two broad categories — a waterborne epoxy coating and powder epoxy coating. A waterborne epoxy coating is normally cured at ambient temperature. It is typically non-hazardous with low-flammability, facilitating transport and handling. The water base makes clean up easier. An epoxy powder coating is usually cured under controlled, high temperature. It is used to produce the surface of many white appliances, such as washers, dryers, refrigerators, and so on. More sophisticated fusion bonded epoxy powder coatings are used to protect steel pipes from corrosion, particularly for water transmission. It is a high-performance material, the cost of which is usually justified in terms of an increase in the life of the equipment on which it is applied.